So self-care. We all know it's important - but do we all really practice it on a daily basis? When life gets in the way, sometimes we forget to simply take time to do things for ourself and relax. If you feel like you've been slacking on self-care (whatever the reason may be), keep reading and find out how you can practice self-care every single day without taking up too much of your time. Remember the importance of routines. Routines are essential when it comes to self-care. The best part? Getting into a routine doesn't waste any of your time - in fact,it will probably save you some time. A morning routine and a night routine will bring balance and consistency to your life, and it's so easy to start doing! I didn't jump on the essential oils train right away. I didn't really see the point honestly, but after doing some research I realized how incredible these tiny bottles of oil are. 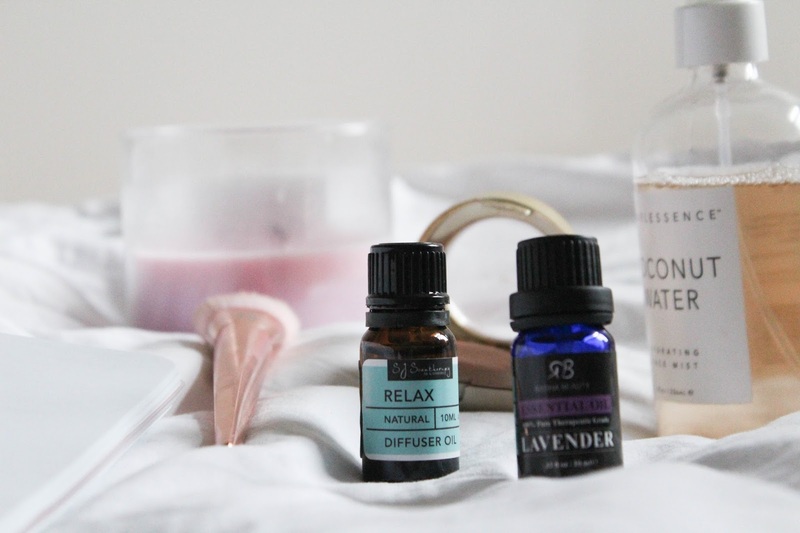 I love diffusing oils in the morning (it helps wake me up) and also at night because it helps me relax (lavender is my favorite nighttime oil). Diffusing oil is a great, simple way to practice self-care. Oils are great for preventing illness, relieving stress, and even purifying a room! Skincare is so important. I just did a post all about winter skincare, in fact. I find that doing my skincare routine is super relaxing. I've gotten into the habit of literally doing it every single day, because if I don't, I just don't feel right. Treating your skin well is the perfect act of self-care. Take some extra time on your skincare each day. Do a face mask once a week. Simply treat your skin well. Spend time alone each day. I think we forget the importance of alone time sometimes. Life gets pretty busy and it's easy to suddenly realize that you haven't had a single moment to yourself all day long. Even if it's just five minutes that you can take for yourself during the day, take it. Alone time helps us reconnect with our minds and keeps us productive and happy. Stop worrying about things that you cannot change. Is this self-care? Absolutely. I honestly believe that your mindset has a lot to do with self-care. Worrying about things that I have absolutely no control over has been something that I've struggled with for a long time. Whenever I find myself worrying about something I cannot change, I remind myself that things always work out for the best. Trust the process. For me, one of my hobbies is blogging. It has always helped me relax and it's a great way for me to decompress after a long day. After finishing my homework for the day, I'll often sit down at my computer and work on a post or edit. Drinking lots of water has so many health benefits. I notice that I feel so much better when I'm hydrated and consistently drinking water. I try to keep a reusable water bottle with me each day and I refill multiple times throughout the day. 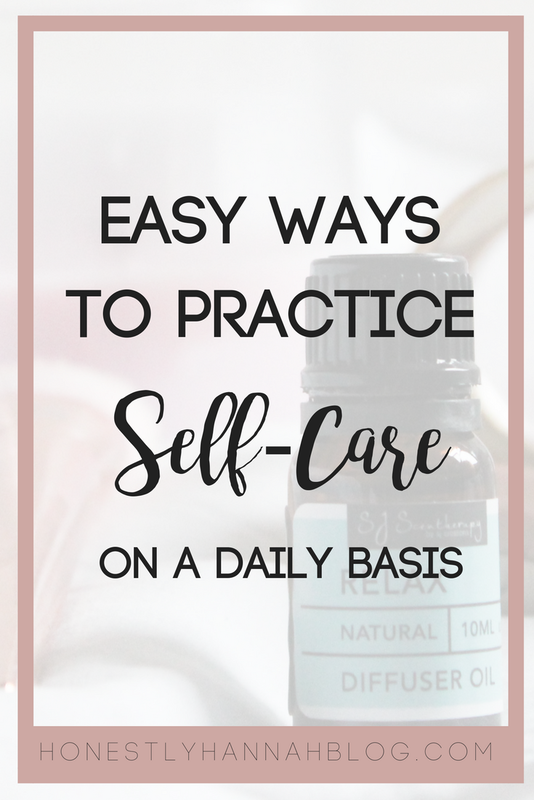 How do you work on practicing self-care on a daily basis? Self-care is something I feel like I need to work on more but I've already been practicing a few bits you've mentioned so perhaps I'm almost there :) Spending time pampering myself on skincare, working on a hobby and alone time are a few to mention.